What are Co Occurring Disorders? If you’re suffering with addiction, you understand how difficult it is. To make matters worse, you may not realize that you have an underlying mental illness. Co occurring disorders are a combination of mental illness and addiction that require dual diagnosis treatment. Having two co occurring conditions can drastically affect mental health. These combined disorders make recovery even more difficult to achieve. If you have a co-occurring disorder, dual diagnosis treatment is your solution. You’re probably familiar with the cycle of addiction at this point. Addiction is also known as a substance use disorder, a term you may hear healthcare and behavioral professionals use. When drugs interfere with relationships, work, or school you may have a substance use disorder. Mental health problems may have motivated you to dangerously self-medicate. For example, those who suffer with social anxiety may drink to relax in public. Others may seek a euphoric high because of their depression. Nonetheless, the sad truth is that drugs and alcohol do not solve these problems, but only make them worse. In some cases, mental illness isn’t present before addiction. Instead, some people develop depression, anxiety, or other mental disorders because of long-term substance abuse. It’s hard to diagnose co occurring disorders. Sometimes you must reach sobriety to receive a proper diagnosis. Unfortunately, substance abuse sometimes hides mental illness symptoms. There are common patterns most people with co-occurring disorders experience. These may occur during your dual diagnosis treatment. Before improving, your mental illness symptoms may get worse. The first phase of rehab is detox which cleanses your body of drugs. In doing so, you’re no longer numbing your depression, anxiety, or bipolar disorder. Experiencing your mental illness symptoms after a period of dormancy is overwhelming. It’s extremely difficult to healthily cope with a co-occurring disorder. When you’re using drugs or alcohol, you’re not growing as a person. Additionally, you aren’t developing positive coping skills. Instead, you may make bad decisions and destroy relationships, leading to low self-esteem. Only treating one disorder increases the likelihood of relapse. For example, an untreated mental illness leads to unsuccessful recovery. Likewise, an untreated addiction interfering with your emotional wellness leads to mental illness. Therefore, it’s so important to undergo dual diagnosis treatment. For successful addiction treatment, you need to solve both co occurring disorders together. 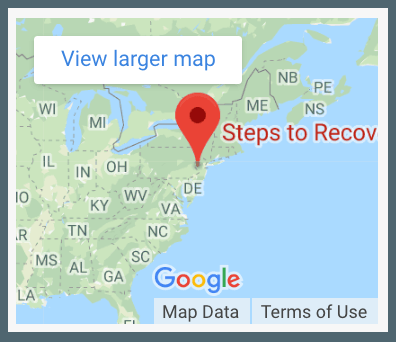 Steps to Recovery in Levittown, PA, treats patients’ co occurring conditions with treatment plans designed for their individualized needs. If you or a loved one is ready for lasting recovery with dual diagnosis treatment, call Steps to Recovery now at 866-488-8684. By seeking addiction help, you’ll create the lifestyle you deserve. Become a better, sober you today.